A £20 million cash injection is urgently needed to help leaders in Kent prepare for "chaos" in the event of a no-deal Brexit, the county council has warned. 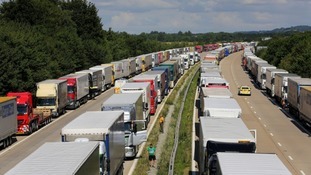 The leader of the council, Paul Carter, said he hoped to avoid a repeat of scenes in 2015, when disruption to cross-Channel traffic saw lorries parked along the M20 motorway under an emergency procedure known as Operation Stack. He called on ministers to fast-track £20m in funding for new technology, signs and staff - and called for a national plan to provide a way to keep trucks out of Kent if it becomes necessary. Since August, the Government has increased its assessment of the potential period of disruption following Brexit day in March 2019 from three to six months, stretching across the busiest periods for passenger movements. In a report to the council, Mr Carter outlined a set of measures to hold as many as 10,000 trucks in the county in the case of Brexit causing major delays. These range from “buffer zones” around the port of Dover and the Eurotunnel terminal in Folkestone to the use of Manston Airport or the M26 motorway as giant lorry parks – or even holding freight traffic outside the county. Mr Carter said the implementation of Operation Stack and closure of the M20 due to a French ferry strike in 2015 was estimated to have cost the Kent economy £1.45m a day, and the UK economy £250m a day. Some 7,000 lorries were parked on the M20 in Kent, causing “significant gridlock and exceptionally high traffic volumes” over three weeks. The following year, a shorter disruption caused delays of up to 12 hours for some travellers. “With national government’s cooperation we can avoid the chaos that we saw in 2015,” said Mr Carter. But he added: “We now need far more input and information from national government in how they are going to work with us. “There must be a national freight transport plan which, when necessary, can hold lorries back from coming into Kent in the first place should the need arise. “We now have holding areas to take more than 10,000 lorries before it becomes necessary to use the M26 to hold freight, which is a situation that I want to avoid as far as we possibly can. He said plans were already in place for Highways England to provide 200 additional traffic officers with powers to stop, direct and divert vehicles on motorways. In the longer term, the port of Ramsgate could be expanded to increase capacity on cross-Channel routes and Sheerness could be developed for ferry traffic, his report said.